They say everything's bigger in Texas. Of course Mercedes-Benz would have us drive the all-new GLE here. 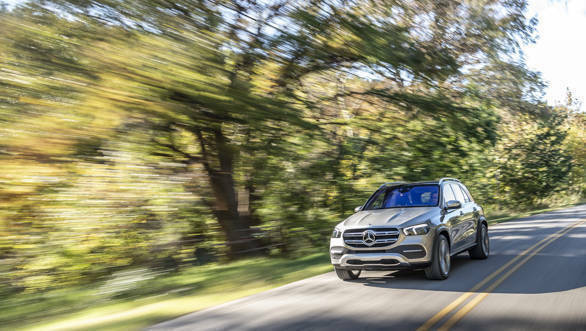 The fourth-generation of Mercedes' mid-size SUV now boasts a nearly-3m long wheelbase and for the first time ever, a third row of seats. Larger exterior dimensions are smartly masked by sleeker design, and it has more advanced technology all-around than the flagship S-Class, and that's saying something. It will have a four-cylinder diesel (300d), and two inline six-cylinder motors, in diesel (400d) and petrol (450), and they're all coming to India mid-next year! It's still a GLE - the reverse C-pillar makes sure that you're immediately aware of the fact. Just that it looks lower, wider and sleeker, almost like it's been shaped in a wind tunnel. That might not be too far off, considering this new SUV is more aerodynamic than before, with a slippery 0.29Cd showing an improvement over the outgoing model. It gets the new Mercedes family face, though with softer looking headlights and the familiar two-tier grille, or in the case of the AMG-line trim, the far sportier diamond grille. 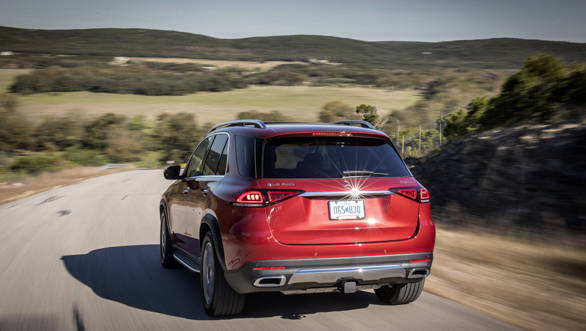 Around the rear, slimmer tail lights accentuate just how pinched the top half of the SUV is, flaring out at the hips especially when viewed from the rear. 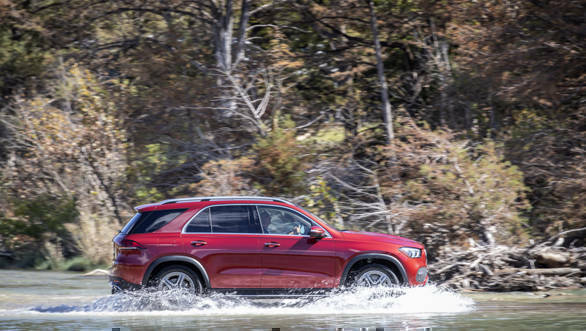 The new GLE has grown into a svelte SUV, despite its size. Though the softer lines do mean it looks more at home in urban settings than the cattle-ranch we drove to. More advanced than an S-Class? You bet it is. If you've seen the video of the GLE dancing (yes, popping and locking no less!) to a very German electrosynth beat, you'll know it has something trick up its sleeve. If you haven't, look it up! The impressive thing is the car in the video is completely stock, just with special code written for its little low-rider-twerk routine. This has been made possible with a new air suspension setup, new hydropneumatics and 48V electrical sub-system, which provides the required power and speed of response to individually raise or lower each corner of the car. It's called E-Active Body Control, and is basically the next generation of what's on the S-Class, to counter lean, squat and dive. In fact, Mercedes claim it's the first car to be able to individually adjust spring and damping rates at each corner - it can even use its radar tech to scan the road ahead and pre-empt suspension settings to allow the body to remain level irrespective of where the wheels are. We'll get to how well it works soon enough, but that 48V system also contributes to the EQ Boost feature on the six-cylinder petrol model. It can provide up to a 22PS and 250Nm boost that works to fill in dips in the powerband of the engine, via an Integrated Starter Generator (ISG). 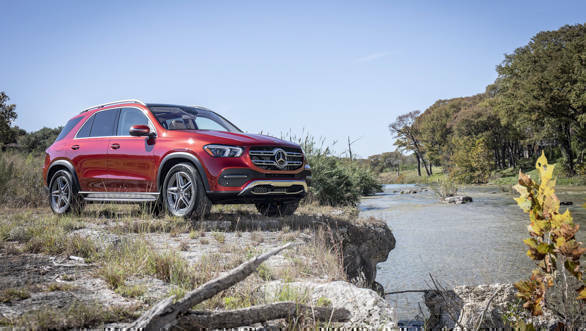 The 4MATIC is new and improved too, and on the six-cylinder GLE 400d and 450, can now provide a torque split between 0 and 100 per cent front-to-rear, apart from getting a low-range reduction gear transfer case. Active and passive safety systems are also improved, with the GLE being able to provide a broader safety net in traffic situations. The highlight in here is the tech, so we'll start with the MBUX infotainment. It's one of the more aesthetically pleasing, and natural feeling 'virtual cockpit' systems we've encountered, using two 12-inch screens and a combination of touch-control thumb buttons on the steering wheel, haptic feedback controllers and touchscreen. It fits in perfectly with the gently arced dash, and not having a binnacle over the instrumentation screen really opens up forward visibility. It also feels mad futuristic, especially with the three customisable screens for the heads-up display and augmented reality navigation! Everything comes together to help you concentrate on the driving (once you're done playing with the toys), though certain features like the voice assistant don't work well with our accents. All the tech is almost enough to take attention away from how well built and luxurious everything looks and feels - plus, grab handles in a luxury car! This is the sort of cabin that can sway decisions its way, over all its current rivals, with maybe just the exception of the Volvos. Seating comfort in the front is supreme, and apart from the excellent hot stone massage cycles offered, there's seat kinetics that subtly alter your seat position over the course of your journey, supposedly to prevent sore backs. It felt strange to me because I was trying to pay attention to the car's ride quality but we can see some of these slightly gimmicky features finding use every now and then. One worth checking will actually track the driver's/co-driver's hand movements and light up parts of the cabin and touchscreen accordingly. 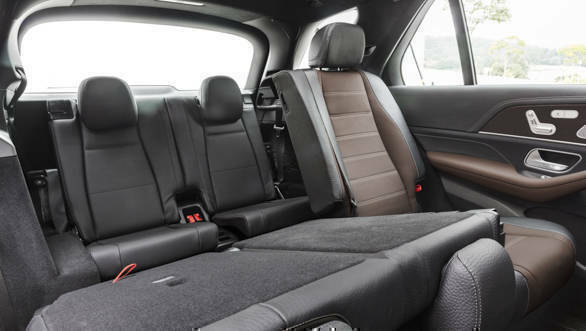 The extra 69mm of legroom in the rear is helped by a fully electrically adjustable second row. Notably, the middle seat is quite usable, with a wide seat squab and low transmission hump. The third row of seats is really too low on the floor for adults, but enough kneeroom can be liberated for kids if the second row is moved forward to its middle position. In the five-seater model, there's 625 litres of cargo space and up to 2,055 litres with the seats folded. New to the GLE, the three engines will replace what's on sale in the current lineup in India. The four-cylinder 1,950cc diesel in the 300d makes 245PS and 500Nm torque, up from the 2,143cc engine (201PS/500Nm) currently in the base GLE 250d. Next up, the inline six-cylinder 2,925cc diesel in the 400d, with 330PS and 700Nm. Impressive, right? It will replace the 255PS/620Nm 350d model, itself a powerhouse. Lastly, the inline six-cylinder 2,999cc petrol which will find home in the 450 model, producing 367PS and 500Nm torque, to take the place of the 400 petrol model with 333PS/480Nm torque, though this engine is mated to the seven-speed transmission currently. All these engines in the new GLE are mated to the modern nine-speed torque converter automatic, with paddleshifters standard. Right, how do they drive? We spent the most time in the 400d and the 450 petrol, both of which are alarmingly, searingly quick for a 2.2 ton SUV. Scratch that, a 2.2 ton luxury SUV. Mercedes claims the diesel will dispense with the 0-100kmph run in 5.8s, and the petrol will do the same in 5.7s, and they certainly feel it. 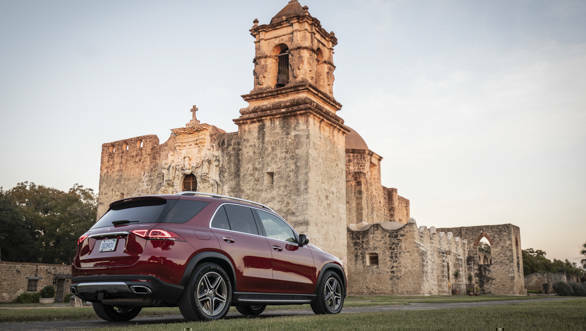 The 400d is obviously the more torquey of the two, and in Texas where everyone drives V8 trucks and nails the throttle from every stop light, the GLE had no trouble staying out ahead. Gearing on both seem ideally suited to stress-free, high speed cruising. On the 400 petrol, the EQ Boost system felt quick and seamless, giving the feeling of diesel-like torque from almost-idle engine speeds. This is especially apparent when just pottering around in the city, and you suddenly realise the parking spot you've been trying to find for the last twenty minutes just opened up ahead of you! The more interesting part is how well the E-ABC tackles the squat from all that torque pushing the rear wheels into the ground (the 4MATIC system offers a 60:40 split usually but is torque-on-demand). But while squat is really well taken care of, the GLE still dives forward under braking. The way it keeps you upright in your seat when cornering is quite something, but it's definitely more a cabin-leveling-comfort thing, and less a grip-generating-handling thing. The air suspension on the GLE is geared towards ride quality and can be a little floaty in its comfort modes, but it offers the best insulation from rubbish roads this side of an S-Class. And wait until you hear the wheel choices we tested - 21- and 22-inchers! The India-spec GLE will likely be offered with smaller wheels, likely from 18-inch onwards. But if that's the ride with large wheels on the relatively blemish-free American roads, we really hope the E-ABC system makes it to India  it's tailor made for our roads! The entry-spec 300d is significantly quicker than the current GLE 250d it will replace. In its 0-100kmph times, and also in the way it irons out the minor lag in the 250d, but falters in the ride quality department with its steel springs instead of the air suspension. It, understandably, had a much tougher time dealing with the large 21-inch wheels than the cars equipped with Airmatic, though with sensible wheels should be much better. We noticed a couple of current-gen GLS drivers eye-balling the GLE at stop signs, and that's exactly what Mercedes would hope for. 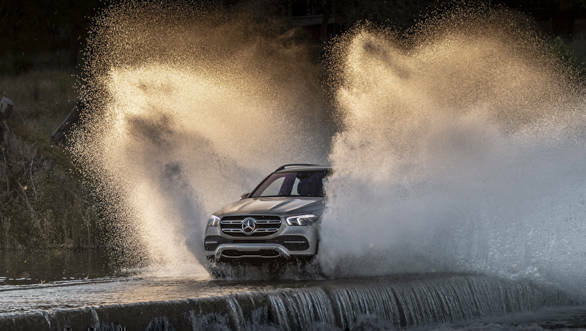 With the new GLE growing in size, getting a third row of seats, flagship-rivalling technology, and powerful new engines, it's definitely going to appeal to the buyer looking for the ultimate Mercedes SUV. 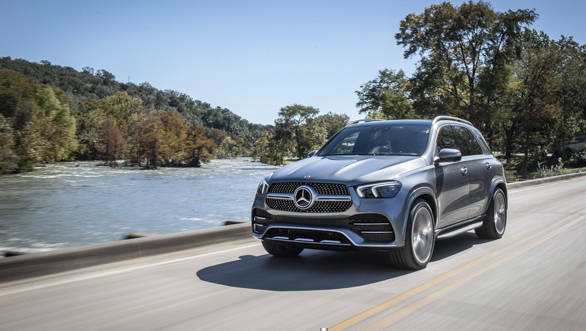 We expect pricing to move up accordingly, but then again, it is the ultimate Mercedes SUV right now.